Click HERE for bib number assignments! Ever dream of running through downtown Seattle without traffic and along the Torchlight Parade route? Sign up now to run on this iconic course with tens of thousands of people cheering you on! Once you cross the finish line, grab a seat and stick around for the Alaska Airlines Seafair Torchlight Parade. Registration includes a T-Shirt, medal, and more. Don't wait... last year’s 2017 Torchlight Run SOLD OUT!!! *Onsite Registration prices will increase on July 28, 2018 to $50 for the 5K and $55 for the 8K. Planning on signing up as a group? Sign up 10 or more individuals at the same time and receive $5 off each entry. Groups must sign up on the same transaction to receive the group rate. The race start and finish is at 4th Ave & Pine St, Seattle, WA 98101. Parking is limited near the start of the race. We recommend parking near the Seattle Center and taking the Seattle Monorail to the Westlake Center Station. Also, the Sound Transit Link Light Rail travels between Angel Lake and the University of Washington. The race start is located near the Westlake Station. Immediately following the Seafair Capital One Torchlight Run, the Alaska Airlines Torchlight Parade will commence at 7:30 pm. The parade begins at Seattle Center and continues down 4th Avenue to South Washington Street, following a portion of the Torchlight Run Course. Join a Team: Pick from a list of team names on the next page and join your team. Create a Team: Once you create a team, participants can join your team under the "join a team" option above. Individual Registration: Register as an individual participant. I know that running a road race, regardless of the distance, includes an element of risk. 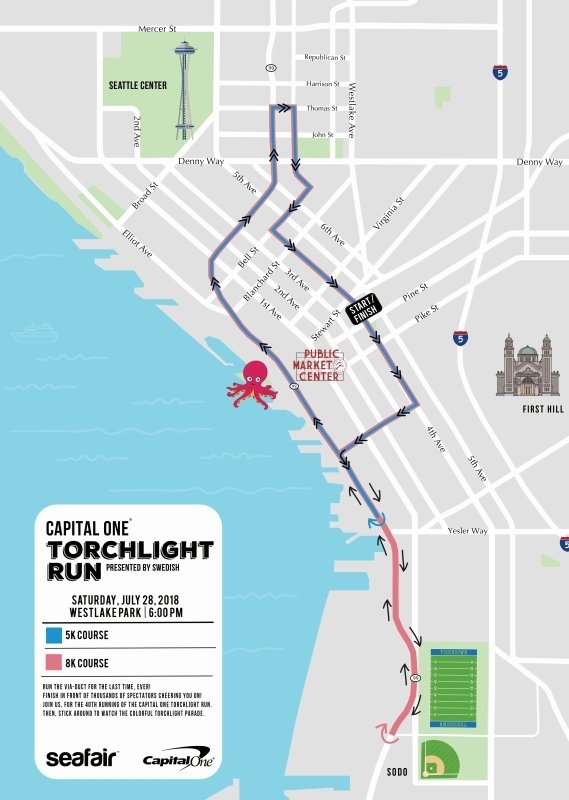 I will not enter and participate in the 2018 Capital One Torchlight Run presented by Swedish at Seafair unless I am medically able and properly trained. I agree to abide by any decision of an event official relative to my ability to compete in this event safely and I further agree that event officials may authorize necessary emergency treatment for me. I also understand that, although police protection will be provided, both vehicle traffic and spectators may be present along the course. I understand, appreciate and assume the risk of participating in this event including, but not limited to, illness, traveling to and from the event, falls, contact with spectators or other participants, the effects of weather, and the surface conditions of the roads and sidewalks. I agree not to be an operator of any wheeled device during the race with the exception of an approved racing style wheelchair with dual handbrakes and a bicycle flag. If racing as a wheelchair participant, I agree that I am fully responsible for my own safety, and I acknowledge all responsibility for any claim made by any other participant arising from collision with my wheelchair. Having read this waiver and knowing these facts, and in consideration of the acceptance of my entry, I hereby for myself, my heirs, executors, administrators or anyone else who might claim on my behalf, covenant not to sue, and waive, release and discharge Seafair, event officials, volunteers and all other sponsors, suppliers, independent contractors, Fizz Events, employees and any other personnel in any way assisting or connected with this event from any and all claims or liability of any kind or nature whatsoever arising out of my participation in this event, including liability arising out of negligence or carelessness on the part of the persons or parties named in this waiver. I also understand & agree that event officials and/or sponsors may subsequently use, for publicity or promotional purposes, my name and/or picture without liability or obligation to me. Entries from minors will be accepted only with a parents or legal guardians signature.